During a 'spy hop' Keiko's three spot markings under his chin can be seen. This was truly one of Keiko's unique identifying features. Keiko was laid to rest after darkness fell on Sunday, in a grave on land near the Norwegian bay where he spent the last months of his life. 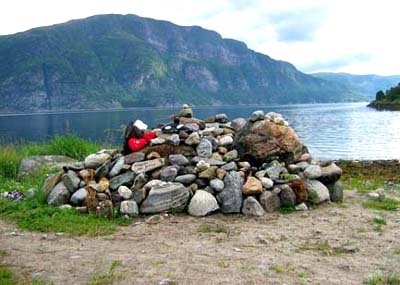 The burial took place during the night to keep it as private an affair as possible. "Keiko is not the only ambassador that has shown us that humans can be destructive and that we can't always repair the damage we cause. May we not feel only sorrow and loss but also the hope that Keiko left for other imprisoned orcas, that they may one day taste the freedom he did. His memory will never fade, but always flicker as a flame of promise to a tomorrow we hope the others will see. Keiko was a great ambassador and I hope that humans stop the capturing of wild marine mammals who were stolen from their families and environment to be subjected to living alone in a cement pool, and all of this done for human greed. It needs to be outlawed and people need to know why. I hope people will realize the atrocity of enslaving wild life. 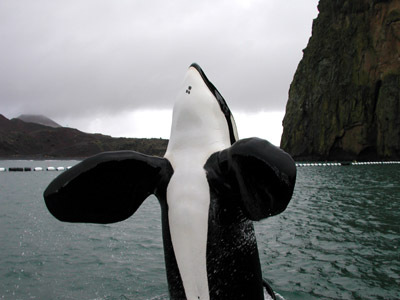 My heart was lightened with the news that Keiko has been buried on land. We, all of us, must not allow his death to have been in vain. As tears roll down my face, I pray he truly felt loved, even at the end, in the absence of man". "It's important to remember that ten years ago, Keiko was floating in a dilapidated tank in Mexico City. He was underweight and he suffered from a serious skin condition. This whale, who was born in the cool waters of the North Atlantic, languished in 80° tap water sprinkled with table salt. 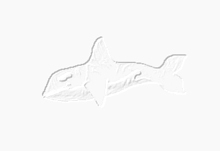 It's amazing to think that the same animal just covered a thousand miles in the open ocean, is diving up to 75 meters for fish and is in excellent health." With His Fans at Bay, Keiko Once Again Takes to the Open Waters. Celebrity killer whale Keiko appears to have made himself at home in a remote bay off Norway's northwest coast. Both Keiko and his keeper from Iceland were ready for their first Norwegian Christmas, with herring on the menu. 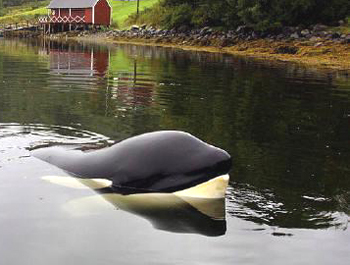 Norwegian authorities have found a new winter home for celebrity killer whale Keiko. They also will protect Keiko from commercial exploitation and continue efforts to reintroduce him to the wild. Norway and the United States have hit the Miami Seaquarium with a one- two knockout punch on the marine park's request to capture Keiko the killer whale and put him back in a tank. Although Keiko's care team has been providing him with herring and mackerel because the fiord is too shallow for the whale to hunt, they are maintaining irregular feeding times to prevent him settling into a routine. Discussions are under way with the Norwegian Government about the possibility of moving him further north to a quieter site, where he has more chance of encountering other killer whales. 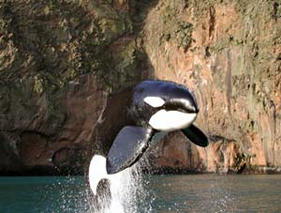 Free Willy/Keiko Foundation maintains legal custody of Keiko. The Miami Seaquarium has applied to The National Marine Fisheries Services to gain permission to capture Keiko, the recently released killer whale once used in the Free Willy movie. In a move that defies common sense, the Seaquarium is working to put Keiko back in the same captive conditions that nearly cost him his life. This summer, Keiko has made amazing strides towards living wild and independently. He has been swimming freely in the waters around Norway for months with no apparent weight loss or illness according to marine mammal experts from the Humane Society of the United States. Please write polite letters to the National Marine Fisheries Service and ask them to deny the Miami Seaquarium's bid to import Keiko and return him to captivity. Keiko-watchers have been concerned about the killer whale's health today after clear signs that the animal was feeling sluggish. He may have picked up an ailment from a human admirer. "We have been worried about Keiko today. He has been less active the past day and been very close to many people. That is why both Colin Baird and veterinarians think he may in fact have a cold. But a cold isn't especially dangerous for a killer whale," Ugarte said. "More and more people want to see Keiko. So it is important for us to extend clear guidelines explaining how people should behave. We also decided at today's meeting that we would give Keiko more room so that he can more easily find his own food" Ugarte explained. 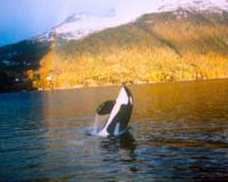 Norway has banned contact with Keiko. WASHINGTON - Nearly 60 days after the orca whale Keiko left his sea pen in Iceland this summer as part of a historic and unprecedented effort to reintroduce him to the wild, visual observations made in Norwegian waters confirm that he is in excellent health. During the past three days, Keiko Project staff obtained close-range photos and video documenting KEIKO's physical condition. "Keiko is free - he is truly free with no ties to human control, no enclosure to restrict him and no regimen other than what he chooses in the wild. Under the leadership of the Humane Society of the United States, Keiko has spent the entire summer in the wild since his satellite and VHF radio tag were attached on July 7. This year, unlike the previous two summers, Keiko has consistently chosen to spend his time with wild Orca, sometimes swimming near pods and other times mingling among his cohorts." Ocean Futures announced the results of a genetics study which reveals that Keiko swam with orcas from his birth 'community' during some of the ocean "walks" he's been taking for the past two summers. 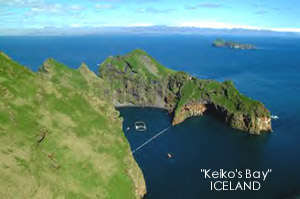 ICELAND -- Some encouraging "Keiko News" has come from the chilly waters of Iceland. Keiko has been swimming outside his enclosed bay for about seven days. Observers report that he is spending hours at a time with other orca pods. This is good news for the whale and his team at Ocean Futures. Before Keiko can ever be free, he must select a pod to join up with. In the past, the mammal has not shown serious interest in any specific pod. The whale's progress is being tracked by satellite technology and a helicopter team. But the team is making an effort to stay far from the pod in an effort to remove all human impact from the interactions. Pod selection is a difficult process, at best. In fact, Keiko may never choose to join a pod. The fact is, whales stay in the same pod for life. Humans know very little about the relationships between whales within the same pod. It's not possible to know what it will take for a pod to allow Keiko to bond with its members. Keiko the killer whale has been routinely spending time with wild whales in his native Iceland for the past two months. But he hasn't yet chosen to join a pod of killer whales, despite many opportunities. Now the people who are trying to reintroduce the mammal to the waters where he was first captured two decades ago are beginning to believe that it may take longer than they had hoped. They're launching a campaign to raise $1 million to match an anonymous donor's pledge. If Keiko has not joined a pod by next summer, they will need this money to continue reintroduction work. Keiko's trainers remain optimistic, believing that their work will be successful. But they acknowledge that it could take another summer of intensive, and expensive, effort.With your help, Keiko's reintroduction can continue. 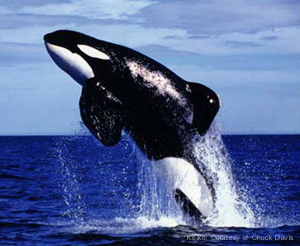 Ocean Futures has received a $1 million matching grant to continue Keiko's reintroduction. We will receive this grant if we can match it with additional donations. Keiko has consistently interacted with wild whales this summer. 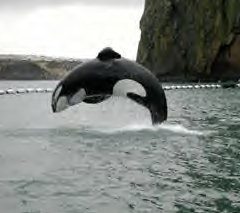 With this needed financial help, we will be able to give him additional opportunities to integrate with a pod of Orca." Please help Keiko, even if you just send one dollar...the thought of him being abandoned again is heartbreaking. 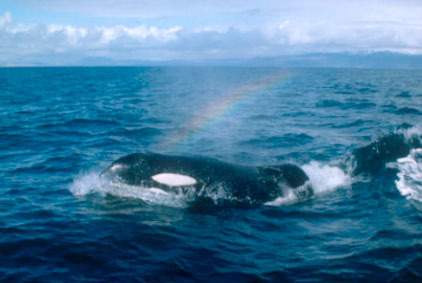 If you kept up with Keiko's story after the "Free Willie" movie, you'll be happy to know how well he is..and beautiful..and happy..please, go to the photo page and see the beauty of his life and surroundings now. As the days draw longer over Klettsvik Bay in Vestmannaeyjar, Keiko's trainers know that they need to be prepared for the famous orca's possible release into the wild. According to the Ocean Futures Web site, Keiko's care team has initiated a regime to vary his routine. 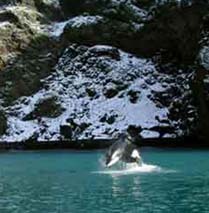 The Ocean Futures Society is the organization that owns Keiko and is preparing him for eventual release into the waters off Iceland, where he was taken more than 20 years ago. Ocean Futures officials say on the Web site that Keiko's exercise sessions are no longer on a set schedule. His training program now includes preparation for open-ocean walks similar to the ones they took him out on last summer. Keiko swam 500 miles of open-ocean walks last year, the first-ever for a captive orca, the Web site says. Trainers also are beginning to vary his feeding schedule to prepare him for gorging and fasting cycles that are common among free-ranging killer whales. The outings not only prepared Keiko, who is best known as the whale in the "Free Willy" movies, for eventual release, they taught his trainers a lot, too. 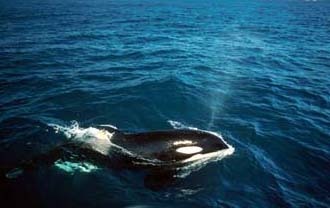 "We know Keiko is comfortable in the open sea," trainers state on the Web site. "After 15 encounters with his own species, we know that he approaches them. In human terms, he appears curious. "What we have learned is that Keiko can do just fine in the open ocean," the Web site says. "Our challenge this spring and summer is to provide him with every opportunity to be in contact with other whales and to interact at his own pace." Trainers are obtaining special equipment to stay for extended times out at sea without returning to Keiko's bay pen. "Last summer, the need for food, shelter and fuel brought us back to the bay and Keiko's enclosure," the Web site says. "This field season we're putting Keiko in charge." The team of trainers plans to be based on a ship at sea with provisions for both humans and the whale. The "walk boat" will take off from the ship and will team up with aerial observers to allow the team to track Keiko on longer journeys away from the bay pen. "We expect to allow him the opportunity to acclimate to other whales without our needs requiring a return to harbor," the Web site said. "And we expect that Keiko will show us more about reintroduction than we know."